This is such a beautiful postcard! I love everything about it. The bridge itself is stunning. 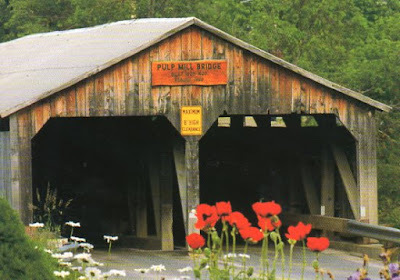 It is the Pulp Mill covered bridge in Middlebury-Weybridge, Vermont. Built 1808-1820 this bridge spans the Otter Creek and is believed to be Vermont's oldest covered bridge still in use and the only double lane bridge still in use in the state.